The presence of methane on Mars is a very interesting topic at the center of many discussions due to the fact that it was detected on several occasions and for the possibility that it’s produced by living organisms. There are also processes that quickly destroy the methane in the Martian atmosphere so it was released not long ago. There’s the possibility that it was produced in a remote past, remained trapped underground and then released recently. In short, many questions that are difficult to answer with a handful of space probes, landers and rovers trying to cover an entire planet. The Mars Express space probe offered one of the first methane measurements in Mars atmosphere in 2004, shortly after reaching the red planet. That time too, it was the PFS (Planetary Fourier Spectrometer) spectrometer built by the Italian Space Agency that performed the detection, the one reported in the new research dates back to June 16, 2013. This time it’s an even more important measurement because it occurred the day after the one by the Mars Rover Curiosity. According to Marco Giuranna’s team, the methane detected from the orbit may have been emitted in an area about 500 kilometers east of Gale Crater. It’s the result of a series of atmospheric simulations based on a theoretical model of global circulation which considered realistic scenarios of gas emission in similar to what happens on Earth. A geological analysis based on different criteria indicated the same region of origin. 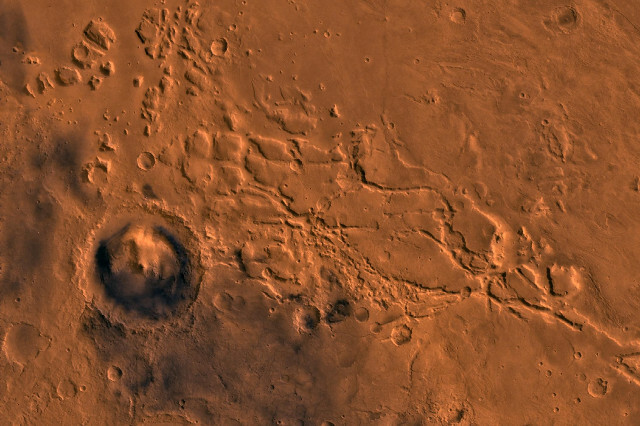 Giuseppe Etiope of the Italian National Institute of Geophysics and Volcanology explained that he and his collaborators studied the Martian geological context in search of structures that could be associated with the release of methane. The faults called Medusae Fossae in the region known as Aeolis Mensae are associated with an icy underground and the permafrost on Earth can contain methane or block a flow of methane below it. A melting that can be even partial, gas pressure accumulating underground, seismic phenomena or meteoric impacts can cause the emission of methane. 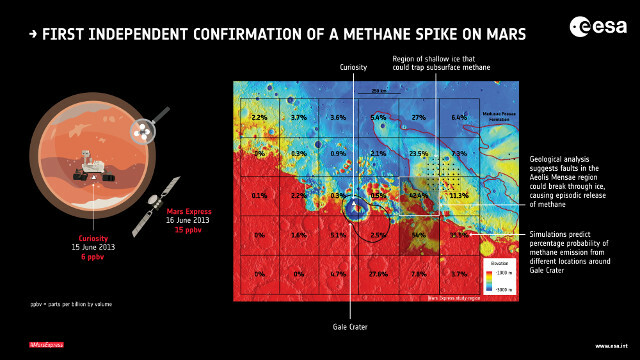 The map in the top image (courtesy ESA/Giuranna et al (2019)) shows Aeolis Mensae divided into boxes showing the values of the probability that the methane detected in the atmosphere above Gale Crater may have originated there. According to Frank Daerden of the Royal Belgian Institute for Space Aeronomy in Brussels, one of the authors of the research, the results support the idea that the release of methane can be characterized by small transient geological events rather than by a constant activity that replenishes its presence globally. However, he also warns of the need to better understand how methane is removed from the atmosphere and how to reconcile the data collected by the Mars Express space probe with those of other missions. Marco Giuranna stated that the ultimate origin of methane hasn’t yet been discovered but the first step to understand it is to find the places where it’s released. His team will re-analyze more data collected by the instruments in the past while continuing the monitoring, which includes the one started by the ExoMars program’s Trace Gas Orbiter space probe. In essence, it’s a step forward in research on Martian methane but there’s still a lot of work to be done to have full explanations. Even if its origin were due to geological processes it would be interesting from the scientific point of view but obviously if it were the product of biological processes, even by organisms that existed in a remote era, it would be an extraordinary discovery.